Andrea Rassell is a filmmaker and creative practice-based researcher in science art. 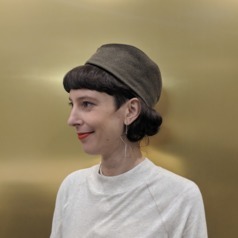 Inspired by backgrounds in film and molecular biology, her practice focuses on the making of experimental films and moving image installations that explore scale, technological embodiment, and the multisensory perception of the sub-molecular realm. Her work has screened at the New Zealand International Film Festival in Wellington, the Imagine Science Film Festival in New York, White Night in Melbourne and Sónar+D in Barcelona.